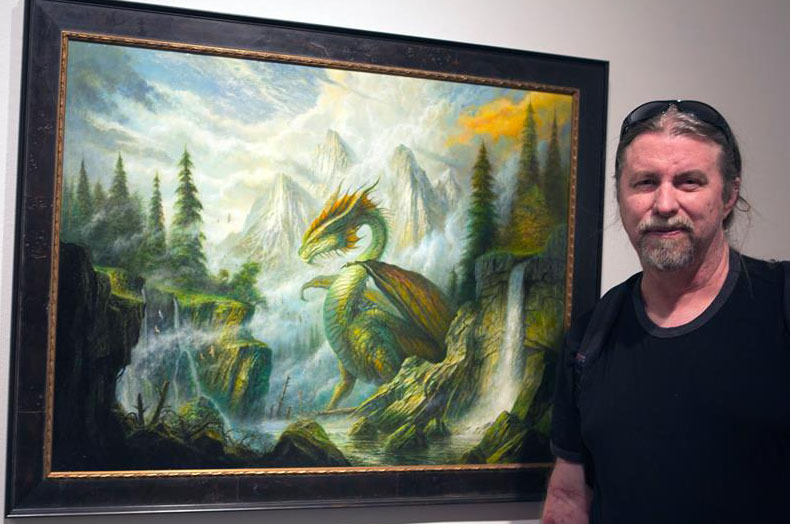 The Boskone Guest Interviews continue with this year’s NESFA Press Guest, Bob Eggleton. A long time and much acclaimed SF/F artist, Bob is a wonderful addition to Boskone’s Guest list this year. From dragons to giant lizards and killer landscapes, you will love seeing what Bob has in store. We’re honored to have him at Boskone and thrilled to bring you this interview. Bio: Bob Eggleton is an award winning science fiction and fantasy artist who works on publishing projects and film concept work (such as Jimmy Neutron and most recently, The Ant Bully). He also has a passion for landscape work, small paintings, and exploring the properties of paint. He has won multiple Hugo Awards, Chesley Awards, The 1999 Skylark Award, and 2 Locus Awards. His art can be seen on many magazines and books. He has been elected as a Fellow of The International Association of Astronomical Artists (FIAAA), and is a Fellow of The New England Science Fiction Association (NESFA). Bob has also appeared as an “fleeing” extra in the 2002 film GODZILLA AGAINST MECHAGODZILLA. You can keep up with Bob’s work via his blog Bob’s ART du Jour. You have been attending Boskone for a majority of your career. When was your first convention? Did attending Boskone or any other SF/F convention affect you as a young artist? Yes it did. I went for the day to Boskone 16 in 1979. It was an artist named Eric Ladd who, at the time was getting a lot of acclaim for his work. He took a liking to my meager efforts and recommended the show. It was a freezing freezing cold day, I’ll never forget it, and I walked from the bus to the Sheraton Boston. The day admission was a whopping $6. I saw some amazing work in the art show. I had corresponded a bit with Ellen Franklin, who was running it then. She was very nice and friendly. I didn’t enter because I just….well, was going for the day (I did end up entering work in NOREASCON 2’s show and winning some nice awards, my first). But I saw up close Michael Whelan’s then-new THE WHITE DRAGON painting, among many great artists works–Don Maitz, Carl Lundgren, Larry Blamire, etc. I had then decided this was what I wanted to do. The Sheraton was a whopping $39. a night to stay during that convention, someone told me. Has it really been 36 years??? Looking back over your career, is there anything you wish you would have known sooner or done differently? I wished I drew “better”. I could draw really well, but I wished it was better. Granted in those days there was very little going for the up and coming artists. We did not have online communities. Art schools schooled the idea of this post-60s non-representationalism and they scrapped the fundamentals of drawing, this is just how it was then. It was really dumb. But, we had the SF con art shows and it was like an oasis of sanity. Back then, the SF bookshelves were like going to a museum of the best covers and art imaginable. Those yellow-spined DAW Books had amazing and fun covers as a good example. I also liked comic books a great deal. Who has had the biggest influence on you as an artist? In what way did he/she influence you? Where do I start?? I would have to go back to the classic artists such as JMW Turner, Gustave Dore, John Martin and Russian painter Ivan Aivazovsky. Of course, my “SFnal Dad” was Kelly Freas. I loved that man. His spirit and energy. In the SF field too many artists to mention!!!! I decided to go back to basics and look at what inspired people like Frazetta and others I admired… rather than copy their work. There was a lot of copying of styles going on. My idea is that you find who inspired who you love and build your own style on that. In school I had a cool guy who lived in the Hyde Park area and was in a gallery on Newbury St, Enrico Pinardi. He was very much a fine artist different from my way but he was amazing to talk with, he taught me alot about thinking about art. He also showed me some of HR Giger’s work. This was just as Giger had gained some great fame here for ALIEN designs. In a 2006 interview, you mentioned that pencil was your favorite medium, followed by oil. Does this continue to be true? What is it about pencil that you enjoy most? In what way does pencil allow you to tap into your artistic vision? Pencil is the first mark. It can be changed. It is the first way of getting your idea down on paper. And pencil is such an ignored medium. Geniuses like Alan Lee and Allen Williams do wonders with it. Just working in pencil. I tend to work VERY quickly in pencil if the idea is exciting I like to get it down in one hit. At that point I know if it will work as a painting. Artists often have “periods” that represent the work that they do during a specific period of time. Picasso had a variety of periods from his Blue Period to his Cubist Period, his Surrealist Period, and others. How would you describe the various periods of Bob Eggleton’s work? Okay….starting off, very spotty, then, VERY airbrushy and slick, and, then getting more painterly and even recently more loose. I’d say I am really happy with my look now. It took a long time to get to that. Too many things. I finished a successful issue, totally painted of GODZILLA IN HELL for IDW. I finished a plate for an HP Lovecraft book AT THE MOUNTAINS OF MADNESS to be published by Centipede Press. I am working on comic covers for a new series called PROJECT NEMESIS, and some Christopher Paul Carey books which are extensions of Phillip Jose Farmer’s ERB pastiches and are lots of fun. I have several paintings for ME that I am working on and some work with Baen and some private commissions and more FAMOUS MONSTERS covers. This entry was posted in Art, Boskone 53, Guest Interviews, Guests. Bookmark the permalink.